Welcome back to another day of super fun giveaways for Scrapping Mommy's 5th Blogiversary Celebration!! I am so excited to see so many blogging friends interested in my giveaways. If this is your first visit, be sure to go to Day 1's post to get entered, too. Today I have something super fun for all the Cricut lovers out there, but first I wanted to share some more fun projects with you. The first card uses the Art Nouveau cartridge (see today's giveaway) and the Letter Envy cartridge. Such a fun card!! The second is a set of cards and a box that is created from the Sweet Tooth Boxes cartridge and the Theresa Collins Sophisticated cartridge. I have really enjoyed being on design teams. 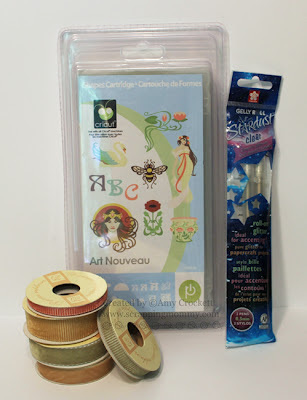 I get to try out new products and samples of stamps and embellishments that I probably wouldn't have tried before. I had tried out for big manufacture design teams when I first got started, but I knew that I wasn't up to par with some of the super talented designers out there today and didn't get the spots. I decided to start out smaller and try out for kit club design teams and smaller challenge blogs. I was so excited when I landed my first design team gig with Apron Strings Designs. They have fabulous kits and I was able to gain experience and knowledge with being on a design team. From there, I was able to let my talent grow from looking through inspiring blogs and magazines. So, don't give up if you have tried out for teams before and didn't make it. I will let you in on a little secret.........I actually tried out for a Provo Craft design team spot many moons ago and didn't make it, so I was super excited when I was invited to join the Cricut Circle Magazine design team this last fall. Yay!! If you want to see what design teams I am on, CLICK HERE. Be a follower/subscriber to Scrapping Mommy through Google Friend Connect or Feedburner (sign up on the right sidebar) and then leave a comment below letting me know that you are a follower/subscriber. If you are already a follower/subscriber, just leave a comment below letting me know that you are. Share a link to this giveaway on your blog, facebook, or twitter and leave a comment below letting me know how you shared my giveaway with a link back to where you shared. "Like" Scrapping Mommy on facebook and post a comment on Scrapping Mommy's facebook wall and then come back here and leave another comment (if you already "like" Scrapping Mommy on facebook, you can leave a comment below letting me know that you do). Follow Scrapping Mommy on Twitter and come back and leave a comment letting me know you are along with your @twitter name. Follow Scrapping Mommy on Pinterest and come back and leave a comment letting me know that you are. Be sure to leave a way for me to contact you if you are a winner. This giveaway is open to those with shipping addresses within the USA. The giveaway will be open until July 8th at 11:59 PM MST. I will then draw a winner via random.org and post it to my blog within the next few days, so don't forget to check back!! I will be having one more giveaway tomorrow, too, so tell your friends and come back to get entered. I've started trying out for design teams, but so far, no offers. But I think it would be an awesome experience to get the opportunity to join a DT. It would force me to try new things and I'd get the chance to make lots of new scrapping friends. Here's a link to my blog post about your giveaway. I like Scrapping Mommy on Facebook. I'm a new follower on Jinger's blog and left her a comment saying you sent me. I can't wait to see her new line of paper. That bee card is amazing! I have never tried out for any design teams, but I would like to. I think it would be an amazing experience. I thought I would give it a little bit of time to get back into scrapping. 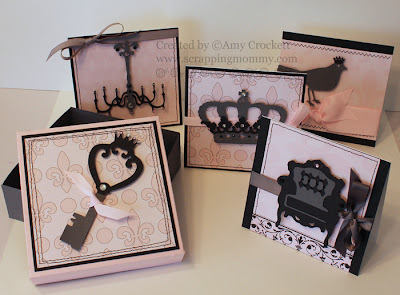 I love you fancy and sweet little cards- great cuts on them. I have never tried out for a design team (it goes back to not having a blog as all design teams want you to have a blog. I am thinking about it more and more though. I am a follower through google friends and also subscribe by email. Following on Pintrest...man I love that place! Following Jinger's blog and posted. Beautiful Cards Amy!! Another wonderful giveaway! I would LOVE to be on a design team! I have tried out a few times. Maybe one day my chance will come!! I'm a big follower of yours!! It's so true about Design Teams! I tried for a little while and almost gave up, then it slowly started happening! Great encouragement - and Happy Blogiversary again! Would love to try out, however, I'm new to blogging and don't know how or who have tryouts. Would love to turn this into a business. Any tips you can give would be greatly appreciated! This is a great cartridge (its on my wish list)! I have never tried out for a design team, but I will keep your wonderful advice in mind when that time comes. I have never tried out but I am fixing to for the DCWV new design team!!! I am also a follower of your blog!!!! I have never tried for a design team, but I am a follower of your blog. Oh my goodness, both projects rock but I love, love, love the second one. I'm going out to buy BOTH cartridges today. The Kraft and black together are gorgeous and the embellishments, ooh la la! I have never been on a design team but you definitely belong on them! Thanks for sharing. good enough. Might try the kit idea as you did. I love your cards and follow you. I tried out for 2 DTs.... made one, did not get the other! The one I made it on went defunct before they ever got off the ground. Can't even recall the name of it. A Muse was the other one I tried out for that I didn't get! I'm a Twitter follower. My so un-original username is @melsusername. HeHeHe. I'm a Pinterest follower. Have you ever thought about how much time you spend pinning? I know that I spend a TON because I'll go on a pinning frenzy and pin EVERYTHING!! Lol. No I haven't tried out for a design team yet. I guess I feel I don't have the time right now but I may try in the future. I already follow Jinger's blog but left a comment that you sent me over. Happy Blogaversary!!!! I've only been craft blogging for about a year, so I haven't made any DTs yet. I've only tried out for a few though, and like you were saying, mostly bigger ones. I kinda like having the freedom to create what I want, when I want...but at the same time, it would be fun to try out new products! After a year of blogging I am just beginning to apply for a couple of design teams. Thanks for the tips on DT's! Already a follower of Jinger's blog, left a comment that you sent me! I have been an email follower for a while now and really enjoy getting them. When I open up my email its like Christmas with lots of creative presents. Wonderful projects, love that bee!!! Yes I have tried out for several design teams and have made a few! Your cards are beautiful. I have been on a design team. I really like the challenging on create a new post, that will be something interesting and never been seen. Thanks for share with us. I just follow Jinger blog and leave her a comment. Happy 5th Blogaversary! I love your cards...TFS! I've never tried out for a design team. I love looking at other's creations, but don't want to be under the stress of getting something done by a certain time. Thanks for the chance to win your awesome candy! I don't have a blog of my own, but I've been following yours by email for a long time and have watched you evolve as a crafter. I don't pop in to leave comments much, but appreciate what you share w the rest of us! Happy blogaversary! I've never tried out for a design team but I've thought about it! Thanks for the chance to win! I posted a comment on Ginger's blog! Sorry to say but I never tried out for a design team as I'm not that creative! That's why I love checking out your blog!!! Inspriation! Yes, I am on two design teams. I won't lie I was scared to death....but it has been an awesome thing. It has helped me with my blogging skills and has made me stretch my creative thinking. As I'm fairly new making cards I consider I'm still learning and I'm not ready for a design team, but I'll give it a try when I improve my skills... Thanks for th chance to win. I am a follower of Jinger. I left her a message telling her you sent me. Yes I have tried and Im one now and was was on another couple months ago. I have tried out for many design teams - luckily I was able to get on three teams and love being on them!!! One day I will get the courage to try out for the cricut magazine team! thanks for the chance to win! I have never tried out for a design team! I love to scrap and make cards but not confident enough to try for a design team ! I have never tried out for a design team, but would like try out for one. I still haven't tried for any DT. I have full confidence in my work, it is the work involving the computer. I still have not found someone that could give me small lessons on the essentials connecting the PC to the scrapping. I am so densed when it comes to modern technology.I would truly love to join one. Just love your wonderful card and would love to win that cart. Am already a follower & subscriber. Am sharing your givaway on my facebook page. Am folowing you on pinterest. I am already a follower of Jingers blog. Went to leave comment. Thanks for the fun giveaways. I was already a follower of Jinger's, but I stopped by and said Hi from you! I'm very new to blogs, got your pic posted, and having trouble with the link. Will keep working on it. Oi am already a follower and I have not tried out for a design team yet but will at some point! I have not tried out for a design team (yet), maybe at some point I will get the courage. I went over to Jinger's blog (which I already follow) and told her you sent me over there. Just got back from Jinger's blog. Hugh fan of her's already. Left a note that you sent me under her nails posts. Can't wait for her new line. Followed you on pinterest and twitter. Already a fan on facebook. I have never tried out for a design team, I am not confident enough in my projects. Although I love the hobby, I just don't think I am good enough. Congrats on 5 years Amy. And thanks for not only offering a giveaway but the tips too. I've never tried out for a design team but I would love to get involved with a group or class of some sort. I already liked you on fb Amy. I'm following on twitter as Tracysuz. And I should have told you abouve that I'm following on facebook as Tracy Suzanne. I'm a new follower of Jinger Adams blog. I have tried for numerous DT's.. so far I've made 2. thanks for the chance to win. i like your facebook already. Lol. Someday when I am more creative I would love love love to join a design team. It is definitely a thought though. Thanks for a chance to win. I am following this blog! Thanks. I am a friend on fb. Thanks for a chance to win! I am a follower of this fabulous blog! Thanks for the chance to win! I haven't tried out for any design teams yet. I may someday. I also visited Jinger's blog and left a comment. I am already a follower. Beautiful cards! Art Nouveau is on my wish list. I haven't tried out for a design team, but I think it'd be fun. I'm already a follower of Jinger's blog, but I stopped over and left a comment. I hope she makes 2000 followers before CHA! Amy ~ All of your cards are just BEAUTIFUL! The bee is just so GORGEOUS! I rarely ever say that about bees buz they sting my poor son but this one is just PERFECT!!! The set of cards are just ELEGANT looking! Again ~ Happy Blog Anniversary! No I have never tried out for a design team., I'm pretty much new to this!!! And u r helping me! I'm a follower of Jinger Adam's blog now!!! no, i've never tried out for a dt. Never tried out for a design team...like to create what I want, when I want. I don't think I would do well with deadlines. Thanks for the great giveaways! I now follow and subscribe to your blog. I "liked" your facebook site and left a comment for this giveaway. Hopped over to Jingers blog and left comment and following her blog. I have never tried for a design team spot. I think of myself more as a scraplifter! Maybe someday I will have the courage. Thanks for all your inspiration and for the chance to win! Really great prize! ;) I have tried out for two design teams and did not make either. Oh well - someday! Never tried out for a design team. My stuff is too simple to even try! LOL!! HI! I GET REGULAR E-MAIL UPDATES FROM YOUR BLOG & HAVE REALLY ENJOYED LOOKING AT MANY OF YOUR CREATIONS & DESIGNS. I HAVE NEVER TRIED OUT FOR A DESIGN TEAM, BUT WOULD LOVE TO BE GOOD ENOUGH TO DO SO. I GET VERY INSPIRED BY LOOKING THROUGH MAGAZINES, CRAFTY WEB SITES, AND BY COLOR ITSELF. IT MOVES ME FROM THE INSIDE OUT. I RECENTLY PURCHASED SEVERAL MORE CARTRIDGES, SO HOPEFULLY CAN TURN THAT INSPIRATION INTO CREATIONS OF MY OWN. I HAVE BEEN SUBSCRIBED TO YOUR BLOG FOR SOME TIME NOW & ENJOY IT IMMENSELY, BUT WENT TO JINGER'S BLOG AS YOU SUGGESTED. THIS MAY SOUND A LITTLE SILLY, BUT I FIGURED OUT HOW TO UPLOAD A PRE-CHEMO PICTURE OF ME TRYING ON A PINK WIG & JUST BECAME A FOLLOWER OF HER BLOG. I RETURNED TO YOUR SITE & WAS ABLE TO BECOME A FOLLOWER & POST MY PICTURE ON YOUR SITE TOO. I FEEL LIKE A DINOSAUR FROM THE ICE AGE THAT JUST MADE IT TO THE PRESENT. YAY! LOVE your cards! The bee one is Awesome!! I have tried out for 5 DTs got a guest designer pos. I did try out for a design team and I MADE it!! I recently resigned after a one year term due to work schedule changes and my mother's recent illness. I really loved being on the DT. It challenged me to do so much more than I had been. I am a fan on your Facebook! Already a follow on Jinger's blog but I left a comment telling her hello!! Happy Blogiversary! Congratulations! I am an email subscriber. I have never tried out for a DT, but I am inspired by many, (present company included). Oops! I forgot my contact info, (just in case)! Thanks for the opportunity to win this beautiful cartridge with extras! I am already a follower of Jinger's, but I'm unable to leave a comment! I have never tried out for a design team. i donot think my creations are good enough. Happy BLogaversary to you!! :) What an awesome giveaway too, I would love to win. I am currently on the Joy's Life Design Team and loving every minute. Thanks for sharing your awesome talent with us all. I am following you on FB, my name is Lori Bowles. I was on the Creative Memories design committee (twice) long before they had a blog. It was really cool to see my layouts on their packaging! I have tried out for two design teams, but was not chosen...and I didn't deserve to be. THere are so many talented people out there, I don't even come close. Thanks for the tips, though. I'm inspired to continue trying. I went over to Jinger and let her know you sent me. I shared a link to your giveaway on my blog. I have not tried out for a design team. I don't have the self confidence in my designing to feel like I belong on a team! I am following you on pinterest. Love the be happy card, I have a friend suffering from depression and this card would really cheer her up.